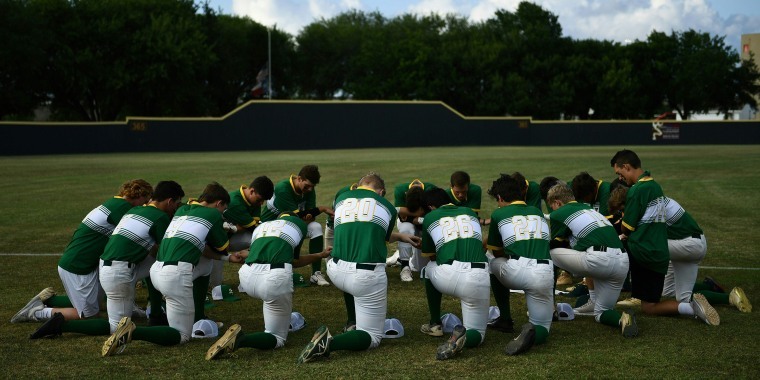 Just a day after the mass school shooting that took the lives of 10, Santa Fe High School students honored their slain peers and community members in a previously scheduled baseball game. Just one day after the Santa Fe High School shooting that took the lives of eight students and two teachers, a group of students did something unexpected and powerful: they played ball. The Texas school’s baseball team was scheduled to participate in a regional playoff game against Kingwood Park High School on Friday night, but in the wake of the tragedy, rescheduled it to the next day. Despite the trauma the community and students are undoubtedly grappling with, the team refused to cancel or postpone the much-anticipated game any longer. Rome, 16, was shot in the back of the head, with the bullet exiting right underneath his ear. He survived. Despite being injured, Rome joined his teammates at the game, which honored those who were killed. Joining Rome was another team member, catcher Trenton Beazley, who is also recovering from a bullet wound. People in the bleachers held up signs that read “Santa Fe Strong,” and held a moment of silence for the victims, which include 17-year-old football player Chris Stone, Pakistani exchange student Sabika Sheik and substitute teacher Cynthia Tisdale. Officer John Barnes, who allegedly confronted the shooter, is in critical but stable condition. Suspect Dimitrios Pagourtzis, 17, is currently being held on charges of capital murder and aggravated assault of a public servant.